I like to begin my day with a bowl of energy-boosting oats and fruits. It really puts me into hyper mode and gets me ready for my day of activities. 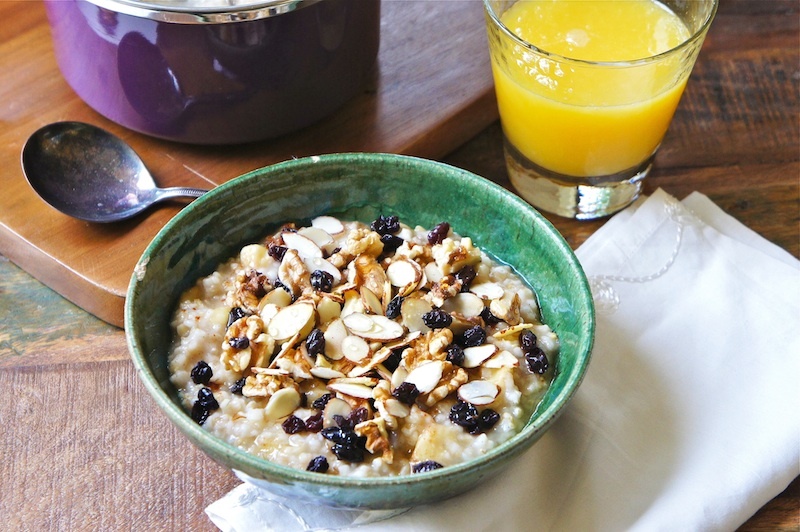 This recipe is for Banana Steel-Cut Oats. It's made with mashed bananas, steel-cut oats, currants, walnuts, almond, cinnamon, and a drizzle of honey, if you like. This energy breakfast fix is just packed with lots of nutritious goodies that is good for your body. Give it a try and let me know what you think. Have a great week ahead! Bring the water and sea salt to a boil. Mix in the oats, lower the heat, cover and simmer for about 20 minutes. Add in the vanilla, stir occasionally and remove from the heat. Then stir in the banana and ladle it into a bowl and top with cinnamon, walnut, currants, almonds, and drizzle some honey, if desired. It looks so good that I want a bawl of this oats now, for dinner!